By working nonstop for about a day and a half, I have managed to get the phoenix piece mounted onto a piece of black velvet (I changed my mind about the color at the last minute), lined with black silk, and hung from a sleeve. I finished barely before my friend Lieven arrived to help me figure out my photography setup. Alas, I positively loathe the results. The velvet has the feel of a “velvet Elvis” to me – it feels cheap and shoddy. The velvet + silk combination is bagging despite being underlined with silk organza, and the whole thing just feels wrong. I think a free-hanging wall hanging isn’t going to work for this piece – it really wants to be held flat. I love Liz’s idea of mounting it to a board and think I may try that next. …or, I may ask my favorite framing shop to solve the problem for me. The one problem is that they typically take three or four weeks to complete a job, and I need to have it done by the 30th. I’ll stop there on Tuesday (they’re closed Mondays) and see what can be done. It’s pretty frustrating to hate the results after a frantic sprint to get it ready, but oh well! No good in complaining, better to move on. You win some, you lose some. Speaking of winning and losing, I have a fantastic opportunity to “pitch” the book to a very promising publisher. A multiply-published friend has offered to introduce/recommend me to the top execs at the publisher, meaning my pitch will definitely get attention. Whether it will be good enough for them to sign me is another matter. So I am scrambling to put together the necessary package – cover letter, sample chapter, table of contents/synopsis, plus information about me and my platform (how I can help sell the book). Fortunately there is no deadline on this, because I need to finish about a dozen other things this month as well! I am hoping to be ready by mid to late April. Which means I had better quit blogging and get back to work! First on the agenda is the book blog posts for this week; after that, I need to write my article for the Designing Fabrics Study Group. And, I need to catch up on email. That’s annoying, that your idea didn’t work out. I do think you are right, though, that this piece needs to be mounted on a board or in a frame. Is there any way you can persuade the frame shop to put a rush on it? Or–you’re so creative, could you frame it yourself? And while you’re viewing this with a critical eye–compare this hanging with an eariler one where you didn’t have the flames outlined. That edging on the flames is making them seem more static, rather than the living things that flames are. I think Ann is right, especially the larger flame with the dark edge. Also, I wonder if it would work to mount the background on a frame, and hang the flame fabric in front of it, so it is hanging loose and can move. Unfortunately, the flames are already fused down – in any case, it would be difficult to hang the flames over a background, unless I fused them to something transparent. 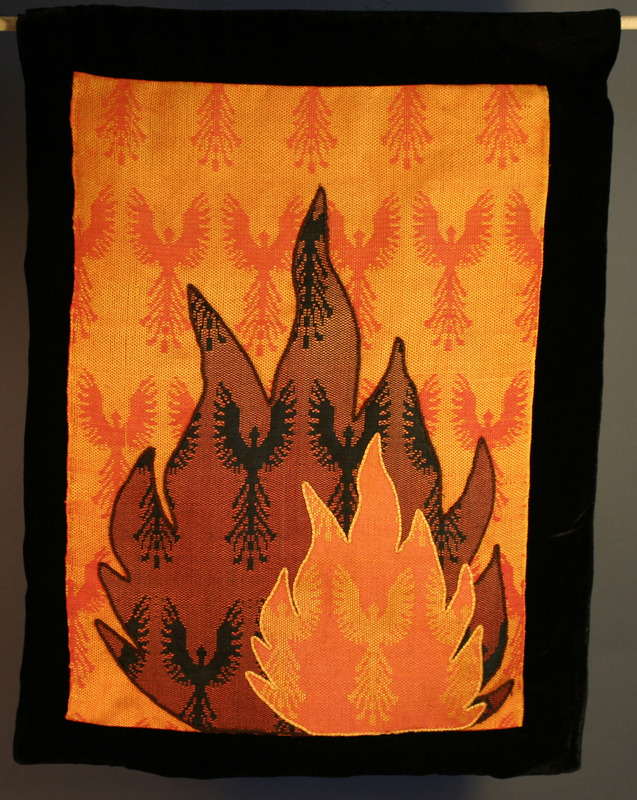 I agree on the edging – if I were doing it again, I’d applique the flames down rather than fusing them, so I wouldn’t have to cover the edges. If you don’t want a board, you could mount the piece to a quilt batting that has a scrim. It would add body and stability with adding too much rigidity. And for dimension, you could tack-stitch around the Phoenix’s through the batting… not really quilted, but it brings the birds to the front basically. The batts with scrim also help with the sagging problem … plus can be used with a board if you choose to do that and softens the hard edges of mounting.